Wearables are the thing for 2015. Nearly every major smartphone manufacturer, including Apple, Microsoft (who delivered MS Band and MS Band 2 in less than a year’s time), Samsung, Motorola, and LG to name a few; not to mention fitness and GPS companies like Garmin, Nike and Fitbit have released a band or smartwatch in 2015. Wearables, and in particular, smartwatches, are a hot commodity right now. Those that have been successful have been hard to get. The Apple Watch certainly falls in that category. The MS Band, at least back in November and December of 2014, also qualify. However, there have been a few new players enter the market. Some of these, like the Tag Heuer Connected represent the high end of the smartwatch market. Others, like the Olio Model One, however, also firmly fall into this category, but unlike the Tag Heuer, are smartphone agnostic. They don’t prefer a particular flavor of smartphone OS; and its here that we’re going to end our smartwatch journey; because… it has arrived. 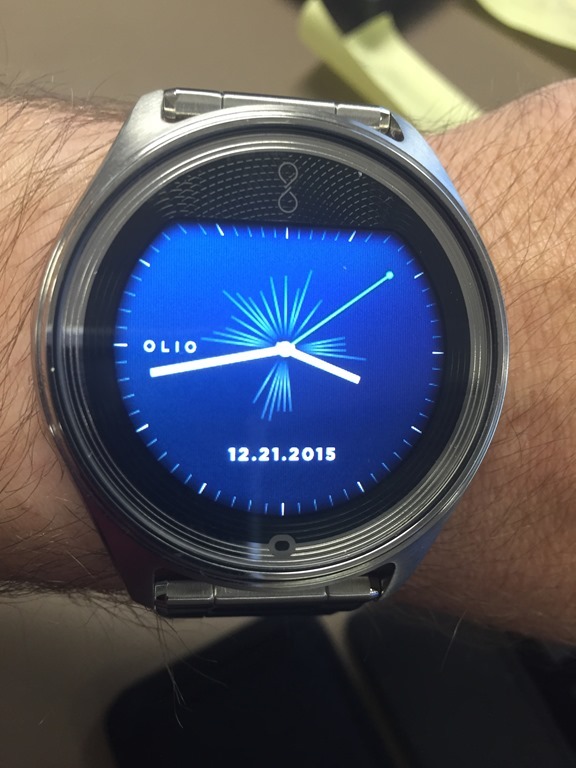 The Olio Model One. Its luxurious. Its waterproof. Its simply stunning. Let’s take a look at it and see how it stands up in a new market, but one that is quickly maturing and see if it’s the smartwatch for you.